Sketch of two cameras (top view and side view), and angles (labeled with Greek letters) to a target (labeled ‘T’). 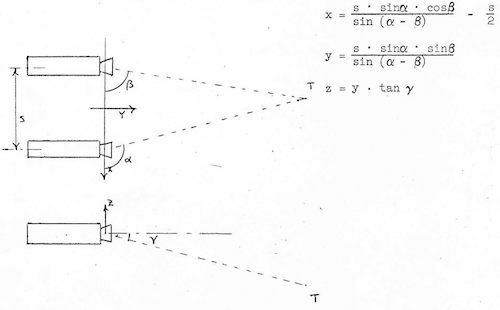 The formulas give the coordinates of the target (x, y, and z) in terms of the distance between the cameras (s) and the angles from the cameras’ optical axes (alpha, beta, and gamma). The next morning, I went to John’s office, handed him the sketch, and said, “Maybe this will be useful for Tom to use on that robot project.” Apparently Tom hadn’t made much progress, because John’s response was, “Maybe you should just work on it.” I still remember the special happy feeling. Dr. Ewald Heer oversaw the robot project. I was told that the purpose was to set up a demo, film it, and use the demo to try to get funding for a prototype robotic planetary rover program. As everyone knows by now, JPL has been enormously successful in building a series of landers and rovers to explore Mars. I don’t know if they tally the generations of their creations, but since this one came before even the first-generation design, I like to call it Generation Zero. Apparently Dr. Heer had some discretionary funds to get this demo done. I never knew how our technical services were paid for, but I suppose that Foster Design (or its successor) was paid for a certain number of bodies, to be used as desired by JPL projects. I suppose that JPL employees were available for assignment to projects as needed. If that was the case, then the cost of the project would be for the robot hardware, the facility in which to run the project, and the filming and editing at the end. In this case, most of the parts came from JPL’s scrap heap. JPL’s origins go back to rocket experiments in 1936. For decades they have worked with materials at the cutting edge of a variety of technologies. As the cutting edge advances, the old stuff is replaced by newer stuff, and the old stuff is either discarded or repurposed. You can imagine that JPL’s scrap heap is full of interesting stuff. By the time I was assigned, Dr. Heer had already identified the components of his project. He had a single engineer, whose name I recall as “Joe.” He had a large vacant room in one of JPL’s buildings. He had a computer. And, most important, he had a robot! The project was basically a two-man show. Joe was the hardware guy and I was the software guy. Joe took the hardware components and integrated them into a system that could be controlled by the computer. By the time I arrived, he had already begun his work; I knew very little about that aspect of the project.